Surveillance camera technology continues to improve, one of the most recent improvements being the use of high-definition megapixel panoramic cameras. These cameras have wide fields of view which allow them to survey a large area with one camera what previously had to be surveyed by multiple PTZ (pan-tilt-zoom) cameras. Their zoom capabilities also allow them to focus in on areas of interest while maintaining a high degree of detail. Panoramic cameras come with either a 180 degree or a full 360 degree field of view, as well as either 8 or 20 megapixel resolutions and enhanced capabilities for day/night surveillance. 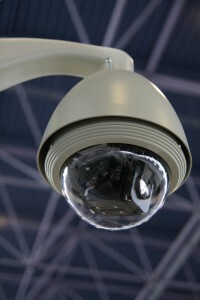 Using a panoramic camera to replace multiple PTZ cameras both improves the efficiency of the security monitoring system and cuts costs, “by requiring fewer software licenses, less network infrastructure and the elimination of additional poles, cabling and power supplies required for installation,” according to Security Today. One example of a good application for a panoramic camera can be found in a waste center in Pennsylvania, where a panoramic camera allows police to monitor the premises for trespassers intent on illegal dumping. The 180 degree camera allows police to oversee a wide field of view of the waste center, and the camera’s zoom capabilities permit the identification of faces, license plates, and the waste being disposed of. This entry was posted on Thursday, October 31st, 2013 at 1:52 pm. Both comments and pings are currently closed.